One set of experiments involved working with Crookes tubes and cathode rays. He discovered that the rays were not like ordinary light. They could be deflected by electric or magnetic fields. He determined that these rays must be made of many small particles. By studying how they were deflected he determined that these particles were negatively charged. It didn't matter what gas the tube was initially filled with or what metal the electrodes were made of. He always got the same cathode rays/particles. Because of this he determined that these tiny particles must be part of all matter. In 1897 he discovered the first subatomic particle, a component of all atoms, the electron. He realized that if there ware negative parts to atoms, then there must be positive parts as well to balance it, because most matter is neutral. 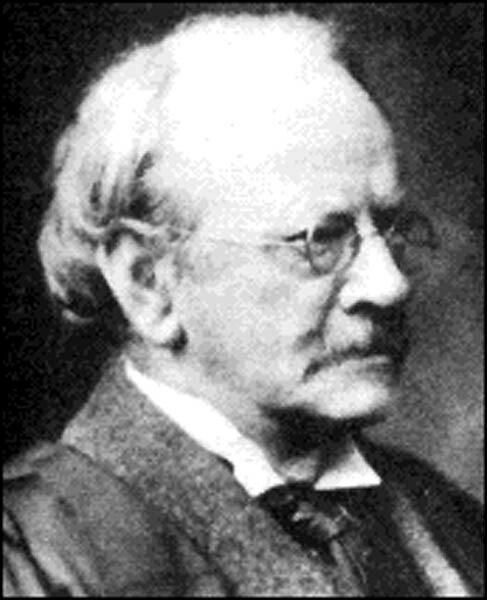 Listen to a recording of J.J. Thomson talking about the atom. This recording was made on 18 October 1934, when Thompson was 78 years old and was found at the London Science Museum website exhibit on electrons. Lord Kelvin (1824 - 1907) proposed a new model of the atom based on the work done by J.J. Thomson. It was said that he thought of this idea while eating dessert. He called the new model of the atom the Plum Pudding model. The negative electrons were the plums sprinkled throughout a positive pudding. The electrons were considered to be hard particles and the positive charge a soft haze of electrical charge.